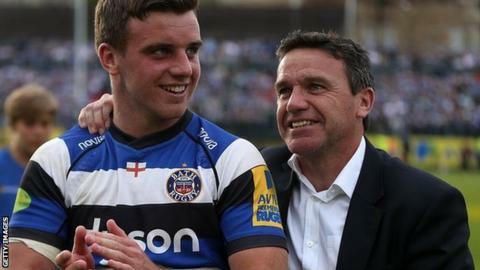 Bath head coach Mike Ford has spoken of the immense pride he feels to see his son George representing England at the Rugby World Cup. George, 22, will start at fly-half in Friday's opener against Fiji. Mike said it will be a special moment to see his son, who he also coaches at Bath, running out at Twickenham. "It's been the same feeling all along since under-8's. You watch him play for England now and it's the same feeling," Ford told BBC Points West. "You are proud at that particular time of what he is doing. I don't look at it like he is one of the best players in the world, you look at him like a son playing well in the game and you are proud." Mike, a former rugby league player, also paid tribute to the character of his son, who has not changed despite his success. "The biggest thing for me is what he's like off the field," he said. "The money he can earn now, the profile players have and he is just so grounded and that is credit to him mum who always puts his feet firmly on the ground. "He is still the same kid and our son. I feel privileged I can see and work with him every day." Mike said he always knew his son had a special talent when he went to play rugby for the first time at the age of four, playing under-7s rugby with his brother Joe. "He played three years above his age, from the very first time he could play," he added. "We were playing a team from Wigan, we were getting a hiding, so the coach came up to me and said 'the next time one of your players gets the ball we'll let him score'. "The ball went to George, he started weaving in and out, their players were diving out of the way and he scored a try from halfway. "I always wondered what that one moment did for him, his confidence and his love of the sport. I think it had a big affect on him."